IQmango PC Cleaner is a tool created for cleaning out unnecessary files from your computer. The main interface contains 4 options: Scan now, Save results, Cleaning and Backup. The latter obviously provides you with the ability to create a backup of your system before your make any changes. 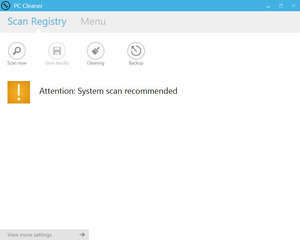 The main scanning feature will search your computer for registry errors, temporary files and broken shortcuts. For security reasons, you should also check out the IQmango PC Cleaner download at LO4D.com which includes virus and malware tests. Additional screenshots of this application download may be available, too.